UPDATE….6/25/15, Cobweb Falls is either on or surrounded by private property! I have removed the directions per request of property owners near Cobweb Falls. The World of Waterfalls Data Base now has this waterfall listed as private as well: http://www.worldwaterfalldatabase.com/waterfall/Cobweb-Falls-16902/. I am not certain that it is on private property or if private property is crossed to get there. Whichever the case is, the locals are not happy. The increased traffic and parking along the small road and the trash being left there by some disrespectful visitors that do not reflect the intentions of most of us that simply love hiking to and seeing waterfalls of all different shapes and sizes have lead up to this. It’s a shame, because Cobweb Falls or Big Creek Falls as it officially known as, is one of the neatest, unique waterfalls I have come across. Hopefully a little time will sort things out. If it is not on private property, then a plan for better visitor accessibility needs to be drawn up. If it is, then we must move on and look for waterfalls elsewhere. Either way, I wouldn’t plan on seeing this one again any time soon. I have kept the details from the hike on here minus the road names and directions. It’s the weekend before Christmas, and I still had some shopping to do. However, it is Super Saturday, a day that is supposed to be the busiest shopping day of the year in 2014, even surpassing Black Friday. The long checkout lines, driving around and around searching for parking places, gridlock jammed intersections? I certainly wanted NO part of it. I grabbed my gear and made off for the mountains. It was a beautifully dark and dreary day across the southeast, just perfect lighting conditions for some waterfall viewing and photography. There was a good deal of rain to be dealt with, but most of it was heading just south of my home region in North Carolina. In an effort to make this the best waterfall photo day that I could, I needed to remain locked in the clouds, but preferably dry. 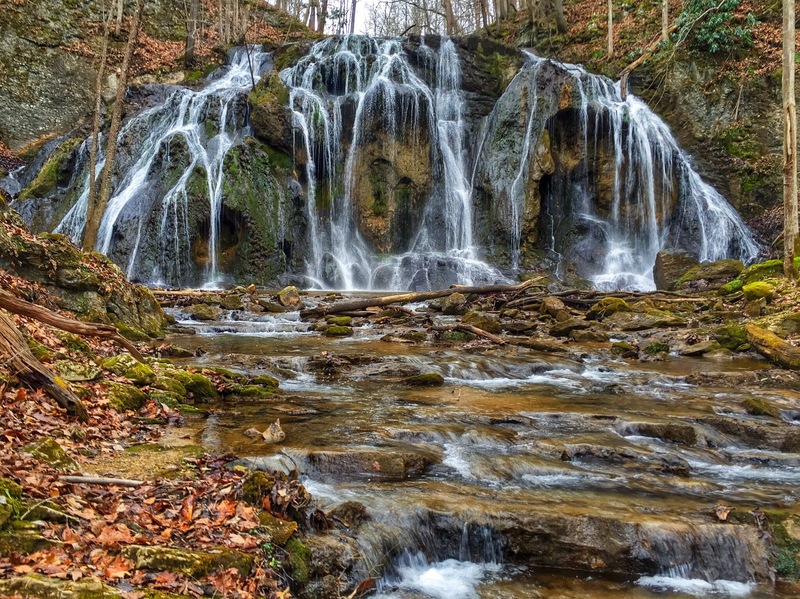 With all the rain to the south, I headed northwest, searching for waterfalls in SW Virginia! This day’s exact location was up in the air for awhile. I have been studying the Hanging Rock recreation area and the waterfalls of the Little Stony Creek for awhile. I thought this was to be my destination. I also considered heading to the Cascades in Pembroke. I do have several visits there, but not on a day in which the conditions were as favorable as they were on this day. I really do want to get back there. I have been focused this year on seeing new waterfalls and there was this other waterfall I had seen several times recently on different Facebook sites named Cobweb Falls. It was closer for me than the Hanging Rock Area, and I have been to the Cascades after all. Perhaps I could see Cobweb Falls and Little Stony or the Cascades if I got in and out quick enough. That..was not going to happen. It was after all the winter solstice, the shortest day of the year. I was however able to find Cobweb Falls , and the WOW factor was high. It was spectacular! This was also quite an accomplishment for me just finding it, because there was hardly any information to be found about it online. 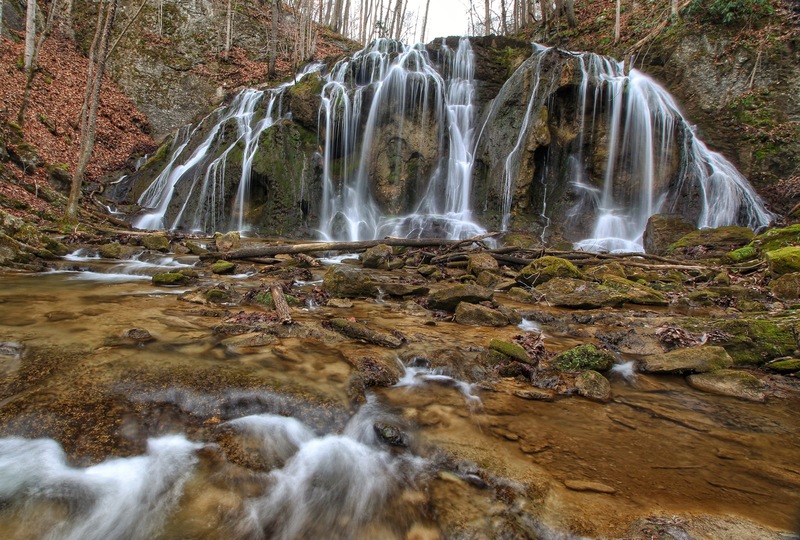 Pictures of Cobweb Falls began showing up this past summer. I first saw it on a facebook page called “Virginia is For Waterfall Lovers”. It is definitely worth checking out. The cover photo is currently from Cobweb Falls though this is subject to change at any time. So, my interest was definitely up for this one. There was just this one problem…I can’t figure out where this thing is. This is where my resourcefulness, and my will to see a waterfall comes into play. I consider this, the hunt to be half of the fun. Researching from only a few available links online, I was able to get just enough info from reading a blog called www.rattreks.com. He goes by the name Rat, and has a very nice detailed article from a July hike here that was full of good photos. He also gave credit to Mark Lackey for showing him this waterfall. His blog entry on Cobweb Falls can be seen by clicking here: Rattreks / Cobweb Falls. I knew this wasn’t going to be a long hike. With the trees all bare, I could see parts of the waterfall from the road I was on. In between me and the waterfall was a large property with lots of people there, private property signs, and the wide Holston River. Luckily the road passed right by the property and ended right next to the river. The next challenge was to be getting across the Holston. 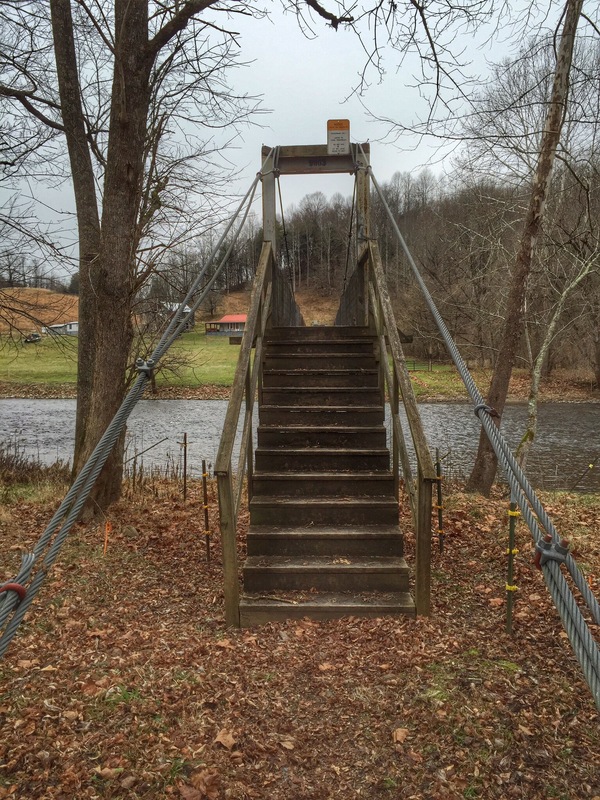 At the end of the road is another one of those footbridges crossing the Holston. I walked up to it and a sign only said that it was limited to pedestrians, and not to make the bridge bounce. So, I proceeded. Not making the bridge bounce was a bigger challenge than I anticipated. I am a big guy and each step made the bridge move considerably. The faster I waked the more it bounced. The mile high swinging bridge at Grandfather Mountain has nothing on this thing. On the other side is another farm straight ahead. Avoid that, and make a right and follow a trail downstream. A small creek in a fairly deep mud covered ditch must be crossed. This is a tad dicey, but after that, it’s smooth sailing. The shooting targets that are on the trees, just above the trail are somewhat disturbing. 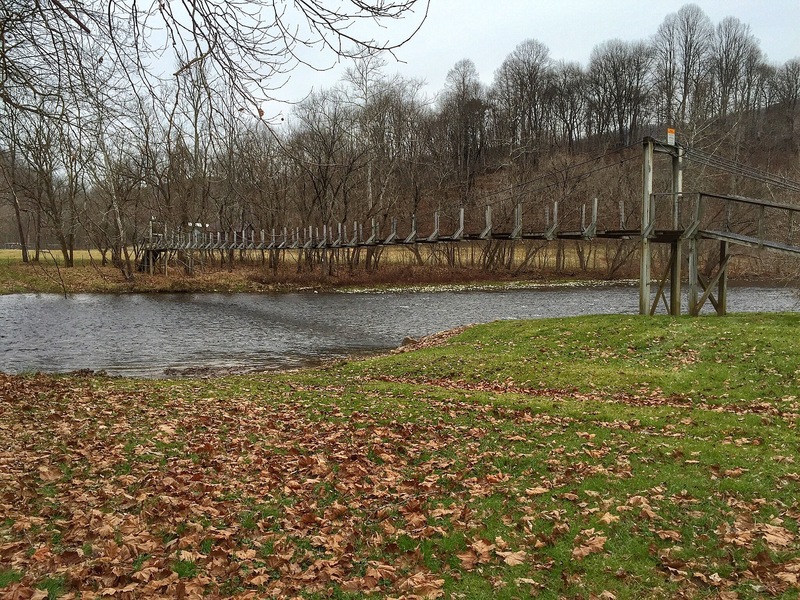 Thankfully, just around the river bend is where Big Creek comes into the Holston River. Just up this 12-15 ft wide Big Creek, this stream spreads its wings and a waterfall with many separate streams of water appears. It is roughly 30 feet high and 40 feet wide. It is quite a breathtaking sight. I was not expecting it to be this pretty, or this large. Here is a short video of Cobweb Falls from 3 different views. I spent a good half hour here, taking shots from different spots in the creek and up the bank to the right. 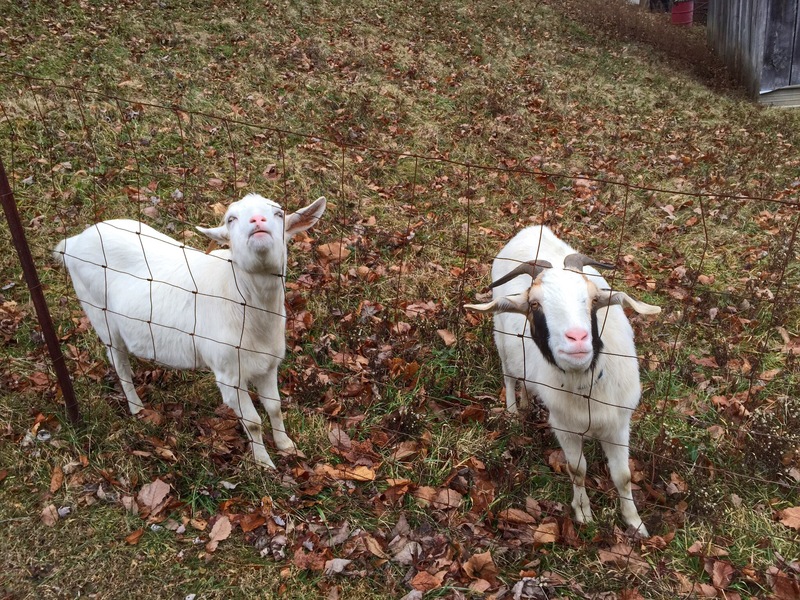 Here are some other shots from the hike back including the goats that keep watch on Cobweb Falls. Chris … thanks for the info this beauty, that is apparently not well known at all. Excellent photos of a gorgeous waterfall. Don’t you just love reading thru Rattreks posts??? Quite the adventurer. But you’re right … he often does not give specific directions to a lot of his locations!! Rat is quite the adventurer and has his way with words. I can’t knock his directions too much because they were the best that I could find, and did get me where I wanted to go. This was a super cool waterfall though and should be included in a trip to SW Virginia, the next time you get up there Brenda. 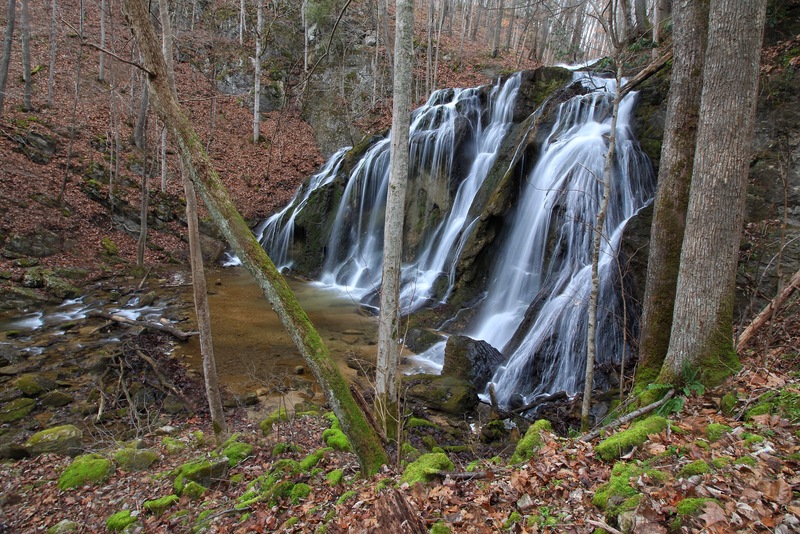 Also, look for the roadside “Waterfall on Logan’s Creek” just before Hwy 80 crosses the Holston. 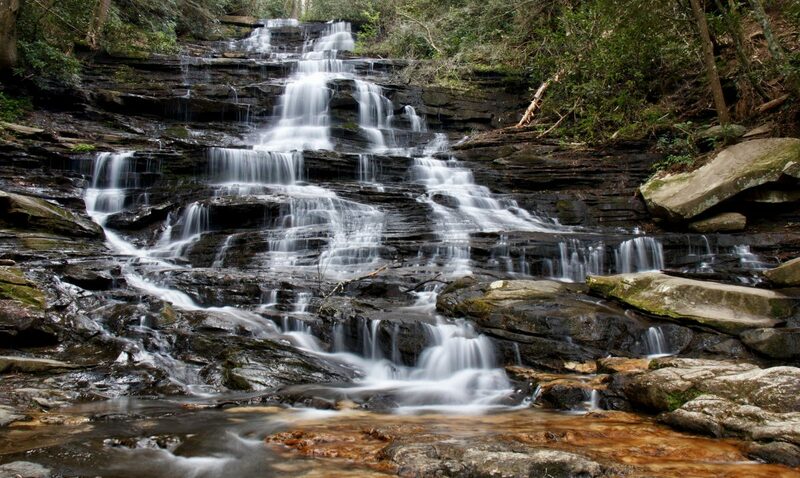 Beautiful waterfalls in your area,especially love Cobweb Falls. Found you on FB where I’m at as well as Flickr. I have always heard that any running water is public. I know for a fact that nobody can own a river, but I don’t know how small a stream must be in order to be private. I have heard that too. Even if the water is public, there certainly isn’t any way to legally hike to it. Parking is out as well. The waterfall is just upstream from where Big Creek empties into the North Fork Holston River. I imagine that if someone was coming down the river by some floatation device, it would only be a short stream walk up to the waterfall. There are just too many other waterfalls to be seen to worry about this one.